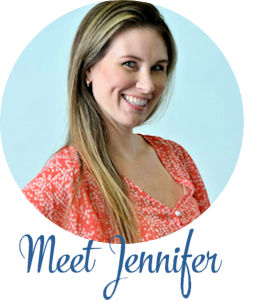 There is not enough time in the day – am I right parents? If you’re looking for a hearty meal to make at home, but have limited time, this 10-minute dish will do the trick! 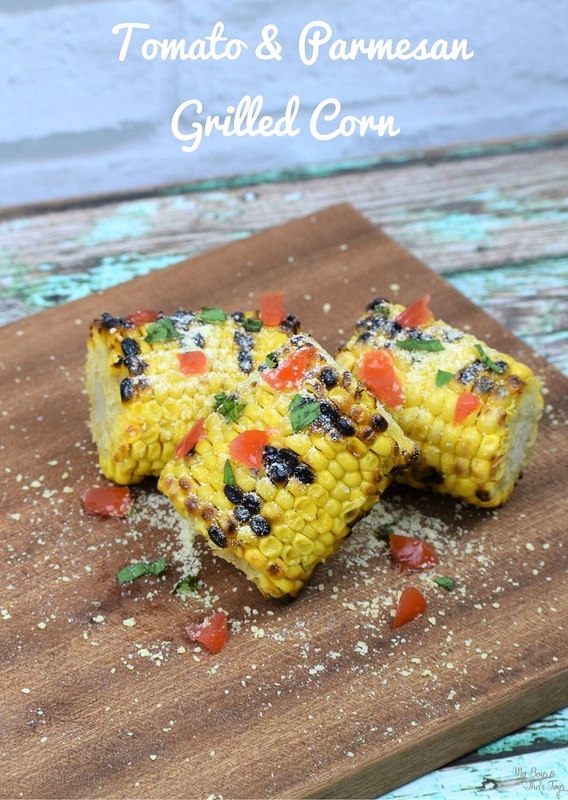 It’s great for lunch or dinner and is something the whole family will enjoy. 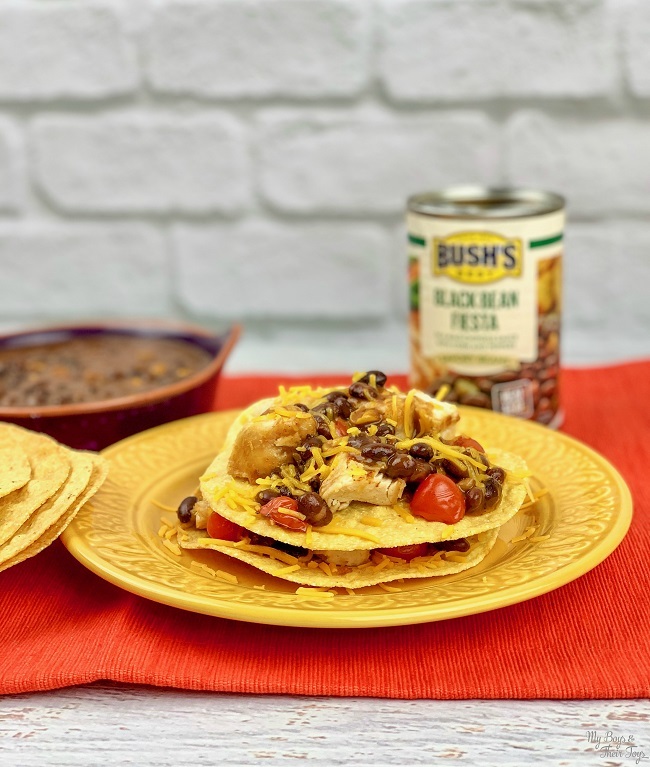 Using BUSH’S® Savory Beans and diced chicken, this delicious tostada black beans recipe goes from stove to table in just 10 minutes! 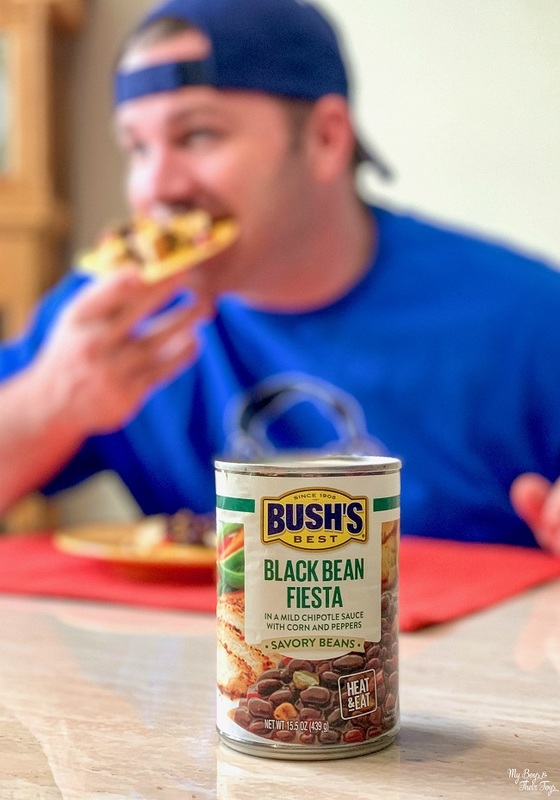 Nothing beats the flavor of BUSH’S beans! 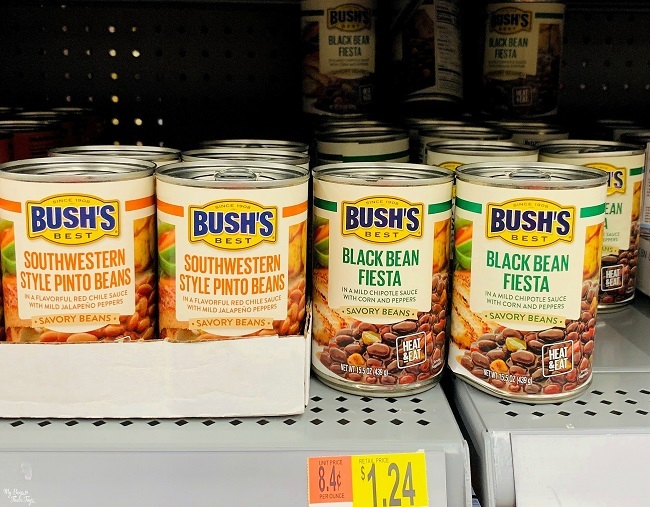 And with the heat and eat option, BUSH’S beans make the perfect pairing for your quick weeknight meal. 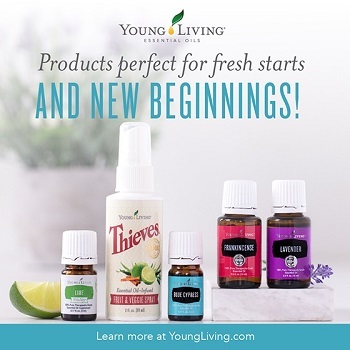 They’re also naturally gluten-free and cholesterol-free. 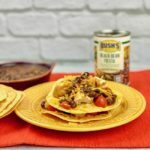 We grabbed a few cans for just over a dollar each at Walmart for this simple tostada black beans recipe. Heat the pre-cooked diced chicken (you can find it in the freezer section) as directed on the packaging. Meanwhile, heat the black beans in a microwave-safe dish or on the stove-top. Cut the cherry tomatoes in half (I like to heat them in a pan for 1-2 minutes). Finally, prepare the tostadas by adding the diced chicken, tomatoes, beans and top it with shredded cheese. Talk about amazing!! 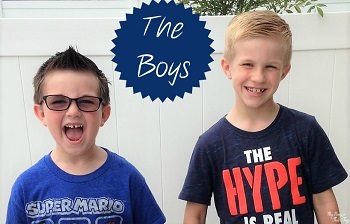 My boys were asking for seconds and thirds – and so will your family! 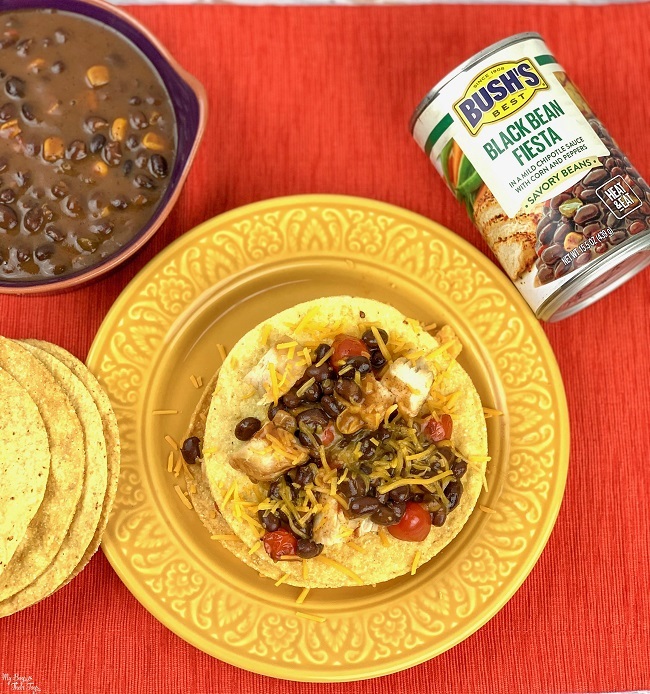 BUSH’S® Savory Beans are made from the best beans simmered in delicious savory sauces. If you’re looking for a quick meal to feed the family, or delicious side to pair with your meal, BUSH’S Savory Beans are the perfect addition. Print this 10 Minute Meal below! 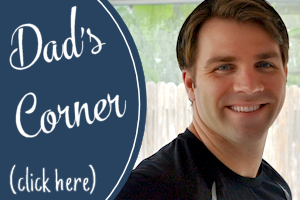 A 10-minute meal that's perfect for the whole family! Heat the pre-cooked diced chicken as directed on the packaging Meanwhile, heat the black beans in a microwave-safe dish or on the stove-top. Cut the cherry tomatoes in half (I like to heat them in a pan for 1-2 minutes) Finally, prepare the tostadas by adding the diced chicken, tomatoes, beans and top it with shredded cheese. Serve, and enjoy! What entrée do you like to pair with beans? 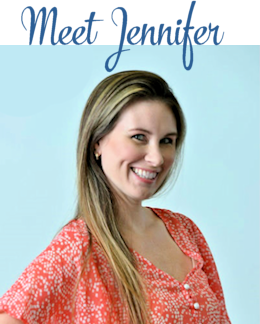 You had me at 10 minute meal, since I am a super busy mom. I’ve always enjoyed Bush’s beans, and these new seasoned beans are awesome. 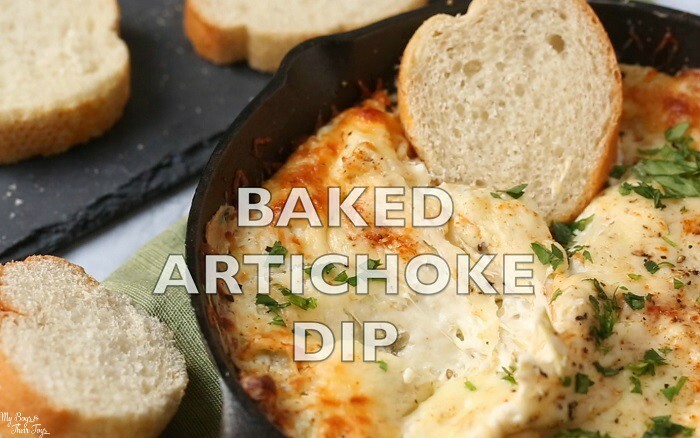 This looks super delicious and super easy. Thank you so much for sharing it. My daughter loves Mexican food so I know she will love this. 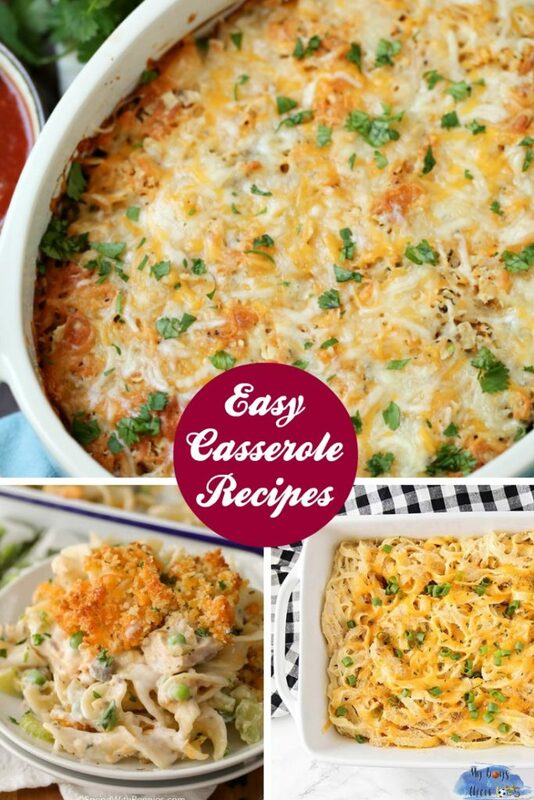 Easy & quick and I know my family would like this! Mmm tostada’s are one of my favorite meals! We love tostadas. This is a really easy recipe. Everyone once in a while I crave tostadas and I usually use refried beans. Bush beans makes them refried too super good.